Click video above for a brief overview of the aftermarket tail light and rear turn signal options available for the Yamaha WR250R and WR250X. One of the most popular mods for the Yamaha WR250R and WR250X is to replace the rear tail light assembly and the front/rear turn signals/flashers. Here is a Tail Light and Turn Signal Lighting Guide for the WR250R that will help explain some of the options. The Edge Tail Light Kit is one of the most popular upgrades for the WR250R (and WR250X). It replaces the big ugly stock tail light/turn signal assembly and gives the bike a much cleaner look. While the Edge Tail Light is pretty bright, I've always thought it could be brighter to help drivers see me a little better when approaching from behind. 12oclockLabs has come to the rescue with their DRC Edge2 Processor Upgrade Board (shown above), which is a drop-in replacement for the OEM LED board inside the standard DRC Edge Tail Light. Not only does it make the tail light and brake light brighter, but it also has features like safety brake pulsing and the ability to flash integrated turn signals (if you decide not to run external turn signals). The unit is also designed with 500,000 life hour capacitors for an exceptionally long operating life. From a safety standpoint, I think the brighter tail light/brake light and safety brake pulsing (brake light flashes a few times when you apply the brakes) are reason enough to install this mod. 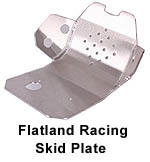 I've already installed it on my WR250R and will be adding one to the WR250X as well. VIDEO: Watch this video for more info on the 12oclockLabs DRC Edge2 Processor Upgrade Board installed on my WR250R. Click above for a short video overview of the DRC Edge Tail Light kit installed on SRmoto.com's WR250R and WR250X. Also mentioned in the video is the 12oclock Labs DRC Edge2 Processor Upgrade Board installed in the tail light of our WR250R. The upgrade board is a drop-in replacement for the OEM DRC LED board, and not only makes the tail light brighter than the standard Edge Tail Light, but also gives you a few additional features like safety brake light pulsing and even integrated turn signals. 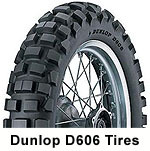 We also mention the flashers/turn signals we have installed on each bike, DRC Type 601's and DRC Type 602's. Shown above left is the stock WR250R tail light and turn signal assembly, and on the right is the WR250R with DRC Edge Tail Light Kit and DRC Type 602 Turn Signals. These before and after photos show how nice and compact the DRC Edge Kit is... a huge improvement over the enormous ugly stock rear tail light and turn signals. You might think the new smaller tail light and turn signals would be harder to see, but in my opinion the new LED's are brighter than the stock lights making you plenty visible from behind, and since everything is smaller, I think there is less likelihood of something being damaged in a crash. On the Edge tail light, all LED's come on as a running light, then all get brighter when the brakes are applied. License plate illumination is provided by 3 white LED's on the bottom of the tail light. 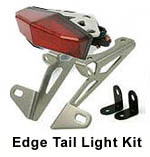 The Edge kit does not come with turn signals, but the DRC Type 602 LED flashers bolt directly to the Edge tail light bracket. Like many WR250R and WR250X owners, I decided the stock rear tail light and turn signals (shown in pic below) had to go. So today I spent some time installing a DRC Edge Tail Light Kit and a pair of DRC Type 602 LED turn signals. The before and after photos shown above give you an idea of the huge improvement this mod makes. Notice how nice and compact the final product is compared to the enormous stock rear tail light and turn signals. And even though the DRC kit is smaller than the factory pieces, I think it is just as visible (maybe even moreso) from behind, since the LED's are so bright. The kit comes with instructions and installation is pretty simple, but it's not a 30 minute job. You'll want to set aside an hour or two so you can take your time and make sure everything is buttoned up nicely. The optional OEM connector kit mentioned above is nice because once you install the pieces on the tail light and turn signal wiring, you can just plug everything right into the connectors already on the bike. It makes for a nice plug-n-play installation. I spent some extra time and used shrink tubing to make sure the OEM connector pieces were on tight and sealed up well. On the DRC Edge tail light itself, all LED's come on as a running light, then get brighter when the brakes are applied. License plate illumination is provided by 3 white LED's on the bottom of the tail light. The DRC Edge tail light kit does not come with turn signals, so I added the DRC Type 602 LED flashers which bolt directly to the Edge tail light bracket. Here is a top down view showing the tail light and turn signals mounted to the rear subframe. Installation is pretty simple and takes maybe an hour and a half. The OEM connectors are nice because once you install them on the wires for the tail light and turn signals, you can just plug them right into the connectors already on the bike. It makes for a nice plug-n-play installation. On the Edge tail light, all LED's come on as a running light, then all get brighter when the brakes are applied. License plate illumination is provided by 3 white LED's on bottom of the tail light. The Edge kit does not come with turn signals, so you need the DRC Type 601 LED flashers which bolt directly to the Edge tail light bracket. Here are some before and after photos. Notice how nice and small the final product is... a huge improvement over the enormous ugly stock rear tail light and turn signals.